One of the best ways to really get back-to-the-basics of a real food eating plan is to look for the local farmers’ markets. I’m very fortunate to live in the South where a Saturday and a mid-week market is easy to find. Our local growing season is long and plentiful. One of the biggest perks of a local market is the price because farmers sell direct to the consumer. You can meet your local farmers, talk to them about sustainable farming, find out if they practice organic gardening , if that is important to you. Getting an “organic” certification is timely and costly. Many farmers have organic practices in place, so just ask! 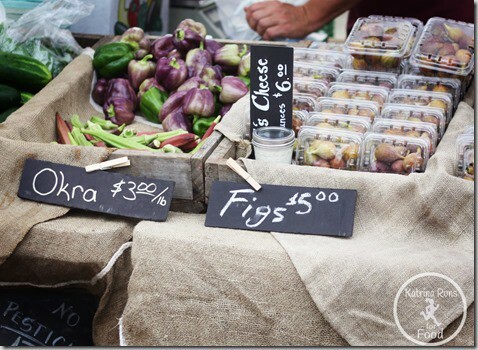 Before you head out for an adventure in farmers’ markets, here are some tips for beginners. 1. Start out early, but not TOO early. Most stalls (whether they are truck beds or actual stalls) open early in the morning and the favorites may sell out early, depending on the crop. Do not wait until the last hour to gather the goods. On the other hand, give everybody time to set up and get their goods ready to sell. I usally arrive after the first hour. I rarely leave empty handed if I arrive around 8am. 2. Have money handy. With the handy dandy credit card cube on smart phones, many vendors will be able to scan your card. But in all honesty, most vendors appreciate the time-honored tradition of FAST bill-swapping. Have your smaller bills handy. Do not expect a market vendor to break a $50. 3. Have a loose plan. Know what is growing in season and know your “must-haves”. I know tomato season is later in the summer. I know spring greens are a must in April/May. I know strawberries are AMAZING in early spring. However, I also know that every Saturday, rain or shine, I can find Miss Emily’s eggs and the Meat Man’s beef and bones. Those are my must-haves and I enjoy the surprise of whatever is on hand. I plan my meals around the Spring and Summer market, which is exactly a little over half of the year. 4. BYOB. Bring your own bags. Some vendors do not keep plastic bags. Bring your own bags or a market basket. Some serious marketers have pull-behind carts. (I secretly want one..but I’ll trip over it. I know me. I’ve seen me do it). It does help to have plastic bags to wrap meat or extra-juicy fruit. Just bring your own bags! 5. Do a walk through. Walk around. Take in the vendors. Look at the prices and condition of what you are looking for. Do not be fooled by the “most photogenic”. Be aware of who has a crowd and why. Is it because they have the prettiest, most waxy looking beans? Is it because the practice organic? Is it because of previous amazing experiences? I have encountered all these reason for a crowd. I have my favorites, but I keep an open mind. Walk around. Enjoy the morning. 6. Try something new. Never heard of pattypan squash? Now is a good time to try it. Many farmers try new produce to see if there is a demand for it. Try new things and expand your meal variety. Those are my tried-and-true tips for Market beginners. Have a wonderful spring market season and stay tuned for my market reports!